Plenty of relationship research has shown the way a conversation begins often predicts the outcome in conflicts. John Gottman coined the term "harsh start-up" to describe how frequently couples argue about nothing, meaning not the topic at hand, but how their partner is approaching the conversation. I've seen first hand this is especially true when couples start opening their relationship. So frequently the tone at the start leads to longer lasting more hurtful communication- right when connection and vulnerability is critically important. 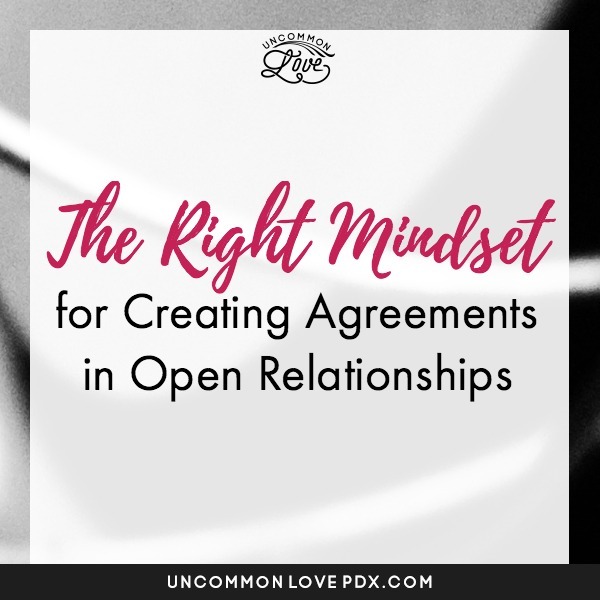 If you've noticed you and your sweetheart in a downward spiral each time you bring up nonmonogamy it might be time to shift your mindset in advance of the conversations to make sure you start things out right. In the last ten years supporting open relationships, I've noticed a critical difference in the folks who navigate these conversations successfully and those who don't. I'll outline them below to help you move forward in your own negotiations. Beginning a conversation about nonmonogamy can bring up lots of surprising reactions if you've never practiced consensual open relationship before. Even some of the most self-reflective skillful communicators find themselves managing overwhelming emotions and unpredictable reactions. If you're experiencing those waves of emotion, you know all too well how ineffective conversation is when you're overwhelmed by a reaction. And yet if you're like most folks you're probably trying to stuff or deny that reaction because it can feel so ugly. The first step in managing that kind of reactivity is acknowledging it's there or "name it to tame it" (as we say in the field of psychology). Name it and accept that the reactivity is a very normal part of this process. That doesn't mean you get to lose all control or be unkind when you feel reactive. But start noticing when it shows up and what you feel like right before it visits you. By collecting a little self-awareness data on the specifics of your reactivity you can start to take action and negotiate agreements based on the information you pick up. Developing more self-awareness about your reactivity also paves the way to humility- an essential ingredient for success in non-monogamy. When we stop trying to be perfect (and shadow-emotionless) we can connect with deeper authenticity to those we love. Self-awareness and humility also foster forgiveness in relationships. Humility and humor help couples stay buoyant in conflict instead of sinking in difficult times. While it's not uncommon to start catastrophizing in these conversations it's also not helpful. Humility helps us remember everything isn't actually on the line. If you're looking to shift the nature of your conversation be sure you're truly in a place to self-reflect and develop self-compassion. How do I know when I am in a reactive headspace? How can I re-center myself when I feel off balance? Am I able to have this conversation without catastrophizing? Trying to navigate an open relationship for the first time often destabilizes folks for a bit. But if you want to create meaningful sustainable agreements create them from a stable headspace. Mistakes are a natural part of developing authentic relationships. But that doesn't mean they don't hurt. And when we hurt a common defense mechanism is to blame others. Unfortunately (like all defense mechanisms) blame gets in the way of connection and learning. It also shifts the focus from the things we can control (our behavior and choices) to things we can't control (our partner's behavior and choices) which leads to feeling more chaotic. To regain a sense of control, and move through difficult negotiations more easily work to notice when you start shifting to blame and instead notice where you can own your contribution to the issue. Am I willing to own my contribution to this dynamic? Am I in a headspace to look at how I would behave differently in the future? If you're not, please pause before starting your conversation about agreements. Being able to give a partner the benefit of the doubt in difficult times is a baseline for trust in partnerships. It sounds like this, "I felt lonely when you were out and disappointed when you came home and didn't enthusiastically greet me. But I know you would never intentionally hurt me." Starting from the benefit of the doubt creates openness for possibility and forces us to let go of assumption-making and resentment-building (both HUGE problems in relationships). It shifts our baseline from focusing on the negative to possibility. If I am in this kind of trusting headspace it is much easier to try to really see things from my partner's perspective. Perspective-taking is a critical skill for couples (monogamous ones too) to get through challenging times. It helps you keep a big-picture mindset (instead of getting stuck in negativity and unnecessary details) and most importantly it encourages empathy. If you can't empathize with your partner's emotional experience (read: this doesn't mean you avoid or fix all their negative experiences- but it does mean you deeply care about them) it is going to be very difficult to maintain connection as you begin practicing ethical non-monogamy. Am I able to consider this situation from my partner's point of view? Am I willing to connect with their emotional experience- even if it is a painful one? Is there anything standing in the way of giving them the benefit of the doubt? If you're not able to connect with their point of view, or there's something standing between you and trust you may want to focus on repair work and rebuilding trust and empathy in your relationship before trying to navigate open relationship dynamics for the first time. One of the most common experiences among folks attempting an open relationship for the first time is fear. Fear of losing someone, of heartbreak, or divorce, of comparison... fear can be completely overwhelming. According to Gary Zukov, the antidote to fear is love. I started a practice helping folks shift from fear, jealousy, and insecurity to love seven years ago and I know it often sounds like fluff to folks who are immersed in anxiety when I first say it. But folks who try to create fear-based agreements are far less likely to sustain them, and far more likely to develop codependent patterns in their relationship (which are NOT sustainable either). To generate longer-lasting agreements, you need to come at them from a place of love and gratitude. Instead of focusing on what you fear, look toward when you want to preserve. Instead of centering anxiety create a plan to reinforce the strengths you share with your partner. Instead of trying to avoid discomfort develop structures to reinforce the resilience, courage, and sweetness you share. Am I able to set fear aside and focus on our strengths? Can I identify when I want more of in this relationship? Am I willing to hear what my partner wants to nourish, bolster, and fortify between us? Couples I've seen stay together through newly open marriages and relationships take on a positive pro-active mindset when they begin the conversation. If you're not in a place to make that shift you might want to start by nourishing your strengths before you take on the conversation about openness. If you want to talk more about any of these considerations I'm happy to talk with you. I've got a few openings in my practice for online clients (video connections) and in-person Portland-area clients who are thinking about opening their relationship for the first time. Give me a call. I lead couples retreats, host workshops, and see private clients online (and in Portland, OR). Call me for a free consultation to rethink the way you do relationships. Newer PostASK ME ANYTHING: IS IT TOO SOON TO OPEN OUR RELATIONSHIP?